I’m mostly dreaming of working my way through some of my TBR pile. Thanks, though. From James Davis Nicoll at tor.com, 100 SFF books you should consider reading in 2019. 100 is a lot for a list. Any list. But I’m mildly interested, even though I really don’t get the impression my tastes overlap all that well with JDN’s tastes. Let’s just take a look and see what he’s got here . . . The Goblin Emperor by Katherine Addison/Sarah Monette. Joan Aiken, good. Handmaid’s Tale, uuuugggghhhh, no. My goodness, I hated that one in college when someone pressed it on me. Self-conscious dystopias, not my thing. LMB, “Mountains of Mourning.” Okay, good. War for the Oaks, yay! Octavia E Butler’s Wild Seed, another yay! Now I”m starting to get more inclined to try other books JDN recommends and we’re only just through the B’s. Oh, Naamah’s Curse by Carey. Not my favorite series by this author. I liked the Kushiel’s Dart series much better. Oh, here’s The Long Way to a Small, Angry Planet. Good choice. Red Moon Black Mountain. Two thumbs up on that one. Oh, here’s the Morgaine series by CJC. You know, I should re-read that. Wow, this is an eclectic list. It’s just all over the place for older vs newer works, well-known vs more obscure books. So far, of the ones I’ve read, that’s one I hated and seven I liked a lot or loved, plus a couple where I like the author quite a bit, though not necessarily the work chosen. Pretty impressive proportion. Click through if you like; I bet those of you around my age will recognize a lot of titles. I mean, look! There’s Enchantress from the Stars! I hadn’t thought of that one for decades. I liked it a lot, way back when. I wonder if I’d feel it’s held up? Here’s Those Who Hunt the Night, Hambly’s first vampire novel. As it happens, I’m reading her most recent title in this series at this very moment. The first book is really still my favorite, but I do like the whole series. Good heavens: Janet Kagan’s Hellspark. Did not expect that. Great story. I mean, the mystery was not so very mysterious, but the characters were wonderful and the setting pretty snazzy. Ah, there’s Patricia McKillip. I was waiting for her to appear. Riddlemaster Trilogy, sure, fine choice, but it’s hard to go wrong with McKillip. Okay, I’m going to skip down to the end of the alphabet now . . .
Ah, not at the very end, but here’s one I really do want to try: Banner of Souls by Liz Williams. I have one more Inspector Chen mystery to read first, but then yes, I would like to try something else by Williams. 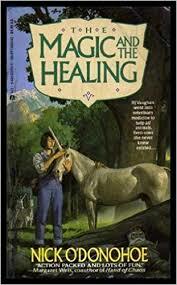 There you go: The Magic and the Healing by Nick O’Donohoe. I learned a lot about writing perceptive characters from this book. O’Donohoe doesn’t have to say: BJ IS PERCEPTIVE, LOOK, DID YOU SEE HER NOTICE THAT? She just is perceptive, and if the reader is as well, then the reader will realize it. Also, veterinary medicine! Fantasy setting! Griffins! I liked it a lot and if JDN’s list of a hundred doesn’t give you enough ideas about older (and newer) titles to seek out, well, here’s another. Got one of your own? Drop it in the comments, because there’s no such thing as a TBR pile that is too high or too unwieldy, right? 9 Comments → I’m mostly dreaming of working my way through some of my TBR pile. Thanks, though. My list would have something by Libba Bray & Maggie Stiefvater- not sure which ones, though. Was happy to see Tamora Pierce on there, though. You won’t like Golden Witchbreed (or most of Mary Gentle’s work–she is a brutal author.) It is grimdark done in primary colors. Ash is different: it is plenty brutal, based on a fantasy of Renaissance era mercenary troops. And most of it is dark–literally dark, with endless night. But it does have a happy ending. Golden Witchbreed emphatically does not: “Break the Prime Directive and see things go absolutely pearshaped.” Very much SF disguised as fantasy. I am unhappy to see no David Drake on that list. He is such a different author. O, and one more. I heartily endorse God Stalk by Pat C Hodgell. Jaime is an excellent protagonist. I’ve read a lot of those, and recently even reread Enchantress from the Stars – it held up pretty well, but seemed a bit didactic. Pete, I though Golden Witchbreed was the half of the story with a happy ending. It’s the sequel that ruins everything. Not that I’m going to reread to find out. There’s only one Gentle book I’ve read and liked enough to keep on the shelves and it’s an outlier: A Hawk in Silver . I wouldn’t select that particular Aiken, it’s almost as bad as Nightbirds. Still, to see her work recommended at all is good. That’s a wide assortment, not just Engdahl, but Lee Killough, Mirlees, and Larbelestier and others. Most of what I’ve read – pauses to scroll & count, about half of the list – is pretty good, too. If you haven’t read Lud-in-the-Mist you should probably give it a try. It’s a pre-JRRT fantasy, that would go well paired with Goblin Market. Second Pete’s endorsement of God Stalk and sequels. And it’s FINALLY coming to an end. Fullmetal Alchemist is very good also, although I prefer the second anime to the manga – I like the art better. I’ve still go the Nick O’Donoho on my kindle waiting for a reread. It’s been years. speaking of things posted on Tor.com, Patricia McKillip has one on the top (at the moment). On Cooking disasters. (3) excellent cautionary tale, period, a la The Quiet American. Thanks for the link to McKillip’s post! Yeah, I think I’ll give Golden Witchblood a miss, regardless of whether it’s self-contained. Aw, it’s nice to see you recommending Nick O’Donohue’s books. You two are both on my gryphon shelf =] Though no longer side-by-side since it began to take over the shelf above it. I don’t remember for sure if I went for griffins because O’Donohue inspired me … but I might’ve! Because I LOVE his griffins.